We talked about how to get clients to deliver content on time here. But what if you’ve got a great system down and you still have people running behind? One of the not-so-fun parts of being a business owner is having to enforce rules and boundaries you’ve set. 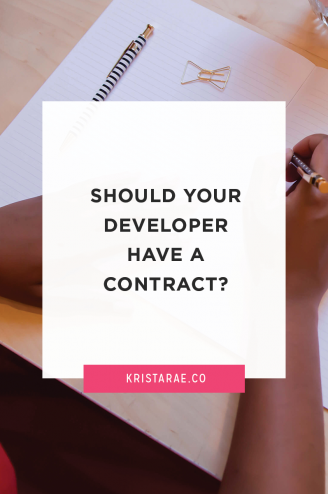 So when a client is late on content you might find yourself hesitating to put their project on hold or charging those extra fees that your contract mentions. No matter what, that part isn’t fun, but there are steps you can take to make it less painful. Today we’ll chat about how to make it easy to enforce consequences around getting client content. If you don’t already have consequences outlined for when a client is late on delivering content (or anything else), it’s time to sit down and think about it. You might think it feels silly or selfish, but consider what it means for you when a client is running late. You likely find yourself in a similar situation when you don’t receive content on time. And if you have a system for making gathering content easy, you shouldn’t be the one that suffers from your client’s lack of planning and prioritizing. Setting consequences that are fair to both you and your client can be the tricky part. The best way to do it is to think about the ways that getting content late sets you back and decide on consequences from there. For example, if it means you’ll have to work nights and weekends, that qualifies as overtime work so you should receive some sort of additional compensation. I personally do $150/day for each day something is late. If you’re not going to work nights and weekends, that means the project deadline will have to get pushed back which is another option for a consequence to put in place. 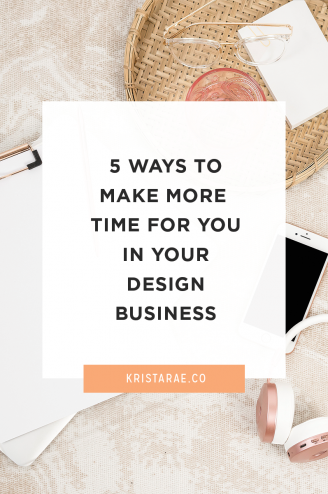 But also realize, when you’re pushing back a deadline, that means you have less time to take on another project during that time so you may still choose to add an additional fee to cover income you’ll lose from not being able to take on another project during that time. And last, determine at what point the project will be canceled or rescheduled completely. This should depend on both how much overtime you’re willing to work to put in a project, what kinds of projects you have lined up after this one was scheduled to end, and how much you’re willing to put up with from your client. For me, after 3 days I cancel the current project and charge a 50% rescheduling fee. Yep, it’s strict, but 1) it keeps people from being late and 2) it covers lost income when I’ve saved a spot in my schedule for someone who chose not to make the project a priority. After you’ve decided what your consequences will be, make them crystal clear for your client. That means, putting them in multiple places in simple language so you’ll never have to hear that “you never told them that”. I covered it in detail in this blog post, but if you expect clients to deliver content on time you need to make that content delivery easy. 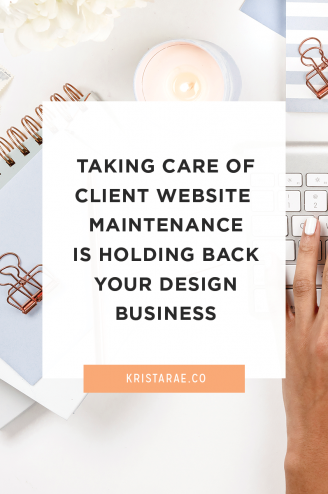 While knowing exactly what’s needed for a new website may feel like second nature to you, it’s a totally foreign concept to most clients. In fact, many might think that either it’s your responsibility to come up with the content or that you can do a complete website design and let them fill in the content later. If you simply ask a client to send their “content”, they’ll be instantly overwhelmed. 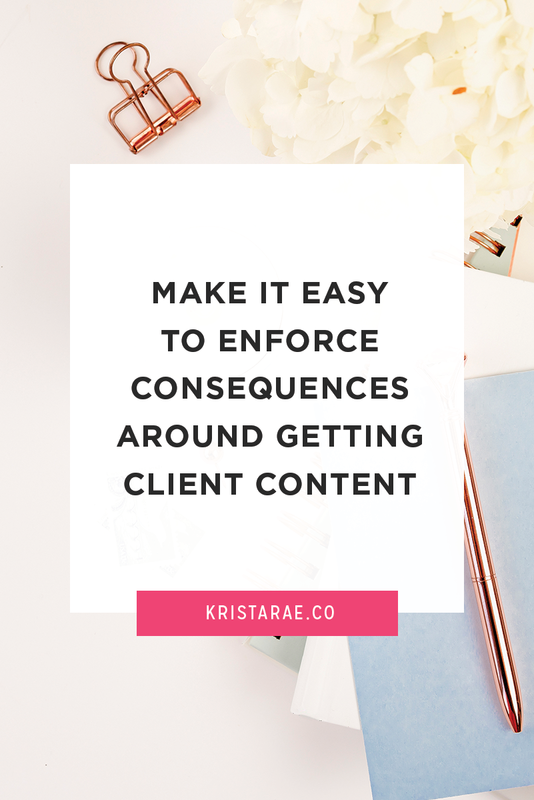 Next, if you’re going to feel comfortable enforcing your consequences, you’ll need to feel like you’ve done your part in helping your client successfully deliver their content. 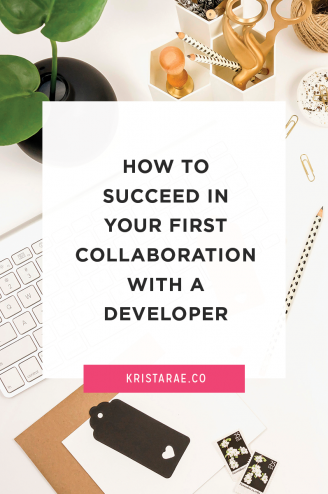 And it’s important to make that easy on yourself, since it’s something that needs to be done for each and every project. To do it, make a follow-up schedule and pre-write emails you’ll send leading up to your client’s due date. This can be fully automated in Content Snare or you can also schedule canned emails in Gmail using Boomerang. Having this set schedule and having canned emails written is important for several reasons. First, you don’t want to reinvent the wheel each time when it’s something you’ll do for each project. Instead, you can save time by creating a system. Second, you’ll be able to be emotionally disconnected once the scheduled emails go out. You won’t have to feel guilty for mentioning consequences or write an email with less kindness than you normally would. You can choose to mention the consequences in more than just the final email, but I prefer to wait until then since I don’t want my clients to feel like I’m bullying them into sending their content. Instead, in the other emails I focus on the importance of their content, how easy I’ve made it for them, and how excited I am to get them results. And last comes the not-so-fun part. Once you have made your consequences clear, made content as easy as possible to deliver, and have provided several reminders, it’s time to enforce your consequences if content is still late. While this is one of the downsides of being a business owner, remember the importance of what you’re asking for. Your clients being late loses you money, makes you work overtime, and causes extra stress that you certainly don’t need. A client not having their priorities straight is no reason for that. So you should never feel guilty enforcing consequences that they knew about from Day 1. I strongly encourage you to enforce your consequences from the very beginning. If you give your client a break once (unless they have an exceptional reason), they’ll expect it over-and-over. Make a system for adding the fee to their invoice or changing the project dates. That way, you don’t have to think about it while you’re doing it. You can follow the system step-by-step. If you know you’d have trouble with these steps, consider outsourcing the task to an assistant or project manager. Don’t wait until the next time a client is late to put these steps into action. Do it now when there’s no extra emotions involved and you can think through it all clearly. Then, the next time a client is running late you’ll have your reminders and content-gathering process to fall back on, as well as a system for enforcing consequences if it comes down to it.